Its short-lived herb often found in cultivated land and present world wide. It's grown up to a height of 30 to 120 cm. In early Ayurvedic texts, Solanum nigrum / Black Nightshade has been mentioned as an important ingredient in herbal heart medications. The juice of the plant is used on ulcers and other skin diseases. The fruits are used as a tonic and for treating asthma. Raw leaves can be cleaned and chewed directly for curing mouth ulcer. This plant's leaves are used to treat mouth ulcers in South India. Boiled extracts of leaves and berries are also used to alleviate liver-related ailments, including jaundice in North India. In Assam, the juice from its roots is used against asthma and whooping cough. Ripe berries and cooked leaves of this plant are used as food. It is good for health. Ripped berries are sweet taste and can be eaten raw. 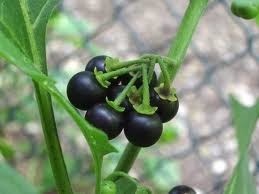 In south India the leaves and ripped berries of Solanum nigrum is used in making different verities for curries. The ripped berries were dried and can used to make vatral kuzhambu.